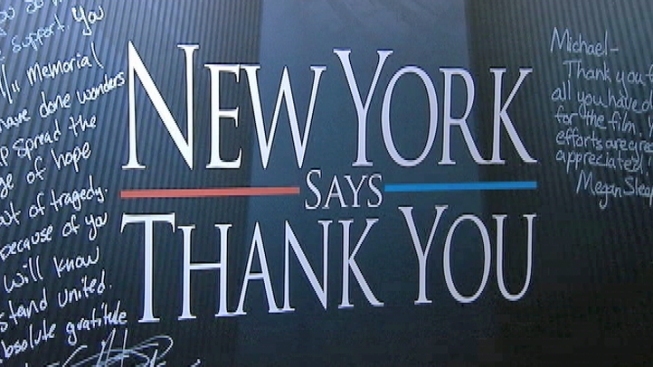 Paying It Forward: Post-9/11 Mood Inspires "New York Says Thank You"
When businessman Jeff Parness lost friends in the Sept. 11 attacks, he knew he wasn't alone. Parness was struck by the outpouring of donations from around the country, as so many unselfish Americans offered to help New York. But he never imagined how much company he'd have when the time came to return the favor. "We focus not just on the tragedy of 9/11 but specifically we focus on how do you honor the spirit of 9/12?" Parness said. Two years after the attacks, his son Evan sparked the idea for a nonprofit called New York Says Thank You. The group sends construction workers, firefighters and other volunteers to regions hard-hit by a recent disaster, like a tornado or a flood. They started with a dozen volunteers for the annual mission. Now, they have more than 1,000. "What New York Says Thank You is really about is empowering survivors of 9/11, and empowering survivors of disasters around the country, with the opportunity to do something positive." Brooklyn native Charlie Vitchers, who supervises construction at barn-raisings and other rebuilding projects for the foundation, gathered unforgettable knowledge when he worked on the recovery effort at ground zero. "During the recovery, for nine months I worked down at the site. I met people from 60 different countries, who were here to help or just hand out bottles of water on the street," said Vitchers. "We know what the community needs are. A lot of our builds have been to bring back a sense of hope to the community. To let them know that, you were here for us, and we're here for you." The foundation has yet to select its 2011 project. It's considering local disasters in North Dakota and Georgia. But unlike years past, this year's trip will take place several weeks before Sept.11, so the volunteers can be in New York to observe the 10th anniversary of the attacks.